J.F. 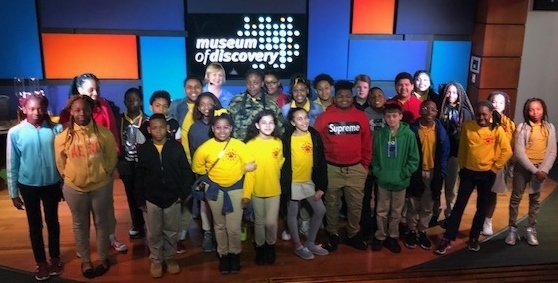 Wahl’s Gifted and Talented 5th and 6th grade students had a field experience with their GT Facilitator, Coach Dyer, at the Museum of Discovery in Little Rock, Arkansas. They visited Discovery Hall to find answers to major questions about our world. With an emphasis on mathematical applications, Discovery Hall focused on the ideas of quantities, shapes, space, and patterns we observe every day and helped students gain a better understanding about how the world works. They also learned how tornadoes form, made rain, and explored migratory patterns of animals that live in Arkansas. For the finale, the students entered Tornado Alley Theater. It provided a riveting seven-minute experience as they relived the tornado that devastated the Governor’s Mansion district area of downtown Little Rock in January 1999. Your child can participate in these field experiences and more through our Gifted and Talented Department. If you would like to nominate a student (2nd-12th grade) for Gifted and Talented, please email Amanda Fears-Eaton, Gifted and Talented Coordinator, at asfears@hwhschools.org.